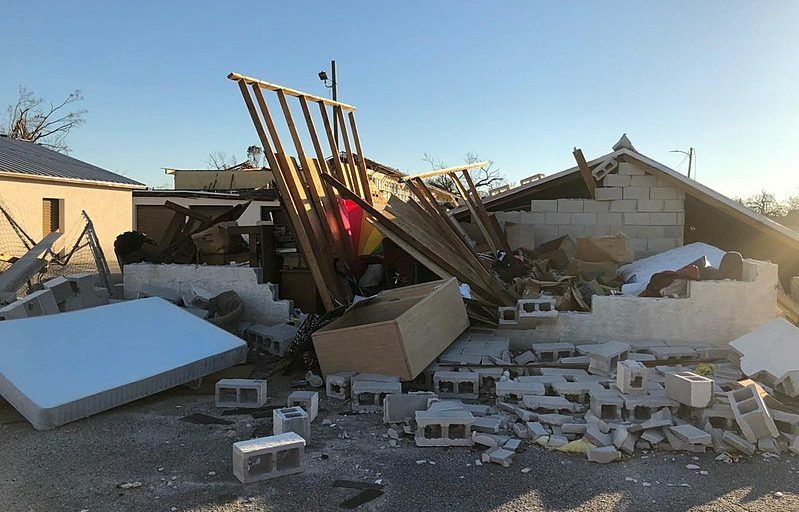 Debris in Mexico Beach, Fla. due to Hurricane Michael. Image via Wikimedia Commons. Eight Florida counties that Hurricane Michael recently decimated will have more lax voting policies for the upcoming general election. An executive order from Florida Gov. Rick Scott will allow voters in the eight counties to call or write a request for vote-by-mail ballots to be mailed to different addresses than those listed for them in the Florida Voter Registration System, News Service of Florida reports. Mail-in ballots can also be delivered to voters or their family members within the eight counties on election day. “With the general election less than three weeks away, this unprecedented storm has impacted the normal operations of administering an election in counties that were hit hardest,” Florida Secretary of State Ken Detzner’s office said in a news release. The executive order also directed Detzner to work with local officials to ensure that utility workers, volunteers and local and state public safety officials were able to cast ballots, according to News Service of Florida. The eight affected counties are Bay, Calhoun, Franklin, Gadsden, Gulf, Jackson, Liberty, and Washington counties, according to CBS Miami. As of the August primaries, these counties have 223,175 registered voters within their jurisdictions. It’s been just under two weeks since Hurricane Michael made landfall in Mexico Beach, Fla., but communities are still struggling with hurricane-related issues. As of Oct. 18, 97 percent of Calhoun County, 81 percent of Jackson County and 66 percent of Liberty County were without power, according to News Service of Florida. Many precinct locations and polling locations within hurricane-affected counties have been destroyed, according to Leon County Supervisor of Elections Mark Earley.